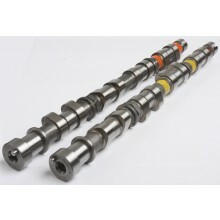 The Kelford Cams range of camshafts for Mitsubishi 4G63 DOHC engines are renowned worldwide for their superior results. This range is for the DOHC 4G63T, from the Evolution 4 to 7. All of the camshafts in this range are ground on our Toyoda and Schaudt CNC masterless cam grinder to consistently deliver the highest quality product. Please note that the only difference between Evo 8 and Evo 4-7 cams is the diameter of the bolt hole in the back of the exhaust cam; For the Evo 4-7 it is 8mm, for Evo 8 it is 12mm. We encourage you to measure your exhaust camshaft prior to ordering your camshafts. 258/264 Degree advertised duration, 10.50mm lift cams. 276/272 Degree advertised duration, 12.50mm/12.00mm High lift. 284/280 Degree advertised duration, 12.50mm/12.00mm high lift.